A rarity in the world of Tolkien's works, Éowyn is a woman who does more than stand around and let the story pass her by. She's supposed to be a strong, capable warrior, but the first two times battle comes it is her lot to run and hide. Looks like J.R.R. Tolkien's about as good a feminist as he is a storyteller. Forbidden to join the Men of Rohan in battle by her uncle, King Théoden, Éowyn takes on the armour of a young soldier and hides her feminine features beneath a sturdy helm. Thus garbed, and armed with her bright sword, she takes a horse and rides to war in secret as a man of the cavalry of Rohan to join the fight for Minas Tirith. 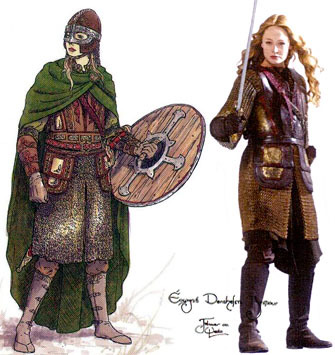 Though raised a lady, Éowyn is no stranger to bearing arms. Her skill with a blade is no less than her King's soldiers' and, when all others are dead or gone, it is she who comes bravely to his aid. You like to see a woman overcoming years of tradition like that. It's a good thing. Especially since she managed to do it under Tolkien's pen. Maybe the long delay in getting Éowyn into the action was to create tension? Maybe it just never occured to J.R.R. that a woman could do more than weep for her man. It's okay, though, becase her bravery is balanced out by the fact that she ends up with Faramir, Lord of the Scumbags. Take off those shoes and get back in the kitchen! We've gotten two Éowyns in quick succession in this Return of the King line, and both are hard to find. It would be good if mister "Dernhelm," here, was more plentiful, since he's generic enough to be a nice "troop-builder" addition to the ToyBiz line. The Rohan armor seen here consists of scuffed riding boots, dark brown pants, a green tunic that falls to her knees and a chain mail hauberk with elbow-length sleeves that is nearly as long as the tunic. A v-necked, lace-up leather breastplate above that is detailed in faded reds, greens and browns and has gold leaf detailing. The uniform is completed with brown leather gloves and laced vambraces, a red baldric strap and scabbard - both with their own detailing - and a Celtic-inspired helmet. Overall, it's a very nice presentation for this pseudo-Nordic race. The detailing here is almost as good as Éomer's, especially in the mail. The basic idea for the peoples of Rohan was "vikings with horses instead of ships." As such, the amount of care and respect that the Rohirrim show their mounts is understandable. 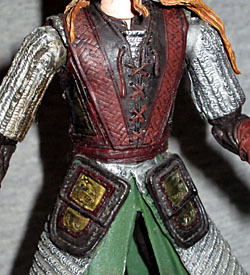 It is a bit odd that out of the many deluxe horse and rider sets we've gotten in the LotR line from ToyBiz, we still have yet to see a single Rohan rider. Still, their equestrian roots are evidenced even in the clothes they wear, from the horse detailing ridge down the center of the soldiers' helmets to the facing horses on the hilt of the sword. Armored Éowyn is articulated enough to do battle, moving at the neck, shoulders, biceps, elbows, wrists, waist, hips, thighs, knees, shins and ankles. She carries a sword and spear, and has a removable helmet and cape. Press the small button on her back, and Éowyn swings her right arm. The likeness is most certainly Miranda Otto, though she looks bit older in figure form than on film - must be the hardships of war. Actually, it seems very appropriate to have Éowyn disguised as man in Rohirrim armor, since that's what actually happened in the film - Peter Jackson, finding himself a bit short of horsemen, glued fake beards on women and stood them in the midst of Éomer's company to swell the ranks. Now you can do the same, provided you can ever find Éowyn.